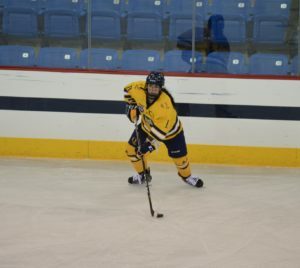 The Quinnipiac women’s ice hockey team (7-6 overall, 3-3 ECAC) got the job done against RPI (4-6-2, 2-0-1 in the ECAC) on Saturday, Nov. 11, beating the Engineers by a score of 2-1. The game did not open with much excitement, as the first period lacked many scoring chances. Both teams had just six shots after one period of play, none of which were grade A opportunities. 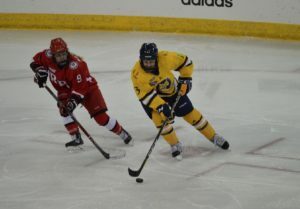 Quinnipiac was able to put an end to the stalemate in the second period when senior forward Raquel Pennoyer put a shot on goal that was originally stopped by RPI junior goaltender Lovisa Selender. Freshman forward Taylor House planted herself just outside of the crease and was able to bury the rebound, putting the Bobcats up 1-0 in the second period. Quinnipiac head coach Cassandra Turner was very complimentary of House and her progression this season. House’s goal was vital in giving the chance to play ahead, but it certainly wouldn’t decide the game by any means. RPI got the game knotted up at one apiece late in the second period, when junior Jaimie Grigsby weaved through the Quinnipiac defense and ripped a shot past Quinnipiac sophomore goaltender Abbie Ives. Turner was not happy with giving up a goal this late in the period, as it was the second time in two nights that the Bobcats had given up a goal with less than a minute to play in the period. The Bobcats didn’t dwell on this late second period goal and came out flying in the third period. They drove possession right from the start of the period and were rewarded with 10:19 left when junior winger captain Melissa Samoskevich scored on a low shot from the high slot on a great feed by junior center Kenzie Lancaster. Samoskevich has been on a roll as of late, as she has scored four goals over the weekend. Quinnipiac grinded it out for the rest of the game, killing off a penalty with just three minutes left to play. The defense, led by sophomore Kati Tabin and senior captain Alicia Barry, came up big the whole night, forcing the Engineers to the outside and not letting Ives have to face many shots. Ives got the win in goal for the Bobcats, stopping 11 of 12 shots on goal. 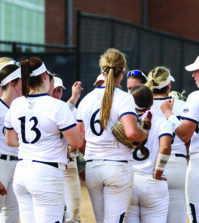 Quinnipiac will be on the road next week in upstate New York for a weekend series against Clarkson and St. Lawrence.